Contact me directly for FLEXIBLE Dates and Pricing!!. Perfectly located on the Lower Riviera, this property offers spectacular ocean and city views from the living room, breakfast nook and front & side decks. Walking or biking distance to downtown, the historical Mission Santa Barbara, Parks, and Restaurants. Close by car are botanical gardens and hiking (15 min), Solvang (45 min) and wine country (60min). We are a family of 6. We lived here after we got married and before we had kids. We now live in Huntington Beach and visit as much as we can. We can't wait to move back to Santa Barbara. We are so happy to open up our home so other can take in and enjoy the beauty of Santa Barbara. We provide hand soap, hair shampoo and hair conditioner for your stay. The kitchen is fully stocked with everything you need to prepare and enjoy a meal. The dinning area seats six. The kitchen is stocked with enough plates, glassware and silverware for 8. Our property has all the amenities of home. We provide fresh linens and towels. We provide hand soap in both the kitchen and bathroom as well as mini bottles of shampoo and conditioner. We do not allow pets because of sensitivity guests with allergies. If you have any special requests please inform us on your inquiry so as we can attempt to accomodate. Unfortunately we were unable to come to Santa Barbara over Labor Day weekend due to Hurricane Harvey, and had to cancel at the very last minute. Daniel was so kind and offered to let us come another weekend or refund our money. He didn't have to do that, but it was such a nice gesture at a time when we really needed it. We will definitely rebook his home when we are able to reschedule our trip! Thank you Daniel. This is a 2 bedroom 1 bathroom, but you can use the futon in the living room as another queen size bed. We had 3 couples during the stay, so as long as no one has a problem with sleeping in the living room it works perfectly. Dining room and kitchen were nice sizes, although we didn't really use the kitchen. There is a patio that you can sit on to relax outside in the fresh air, if you want there is a BBQ that you can pull out and use as well. Please Note: This is a large house that has been converted into 2 homes, so there is another resident that lives in the back half. You will see this as you walk up to the front door, as you have to walk in front of his patio & front door in order to enter the house. Super friendly guy, he also takes care of the property and if anything goes wrong in the home you can knock on his door. The house on Grand was perfect for our family of five and our week vacation to Santa Barbara. The location is fantastic, just up the hill a bit to have great views of the city and ocean, but not too far up. It was an easy walk down to State St and the rest of the downtown attractions. It's a small, quaint house, but the layout is perfect and it was well stocked with everything we needed. We'd absolutely stay there again! Worth sharing with 4-6 people, more if you have an air bed. Very charming. Perfectly located on the Lower Riviera, this property is walking or biking distance to the historic Mission Santa Barbara, county bowl, parks, restaurants and downtown. 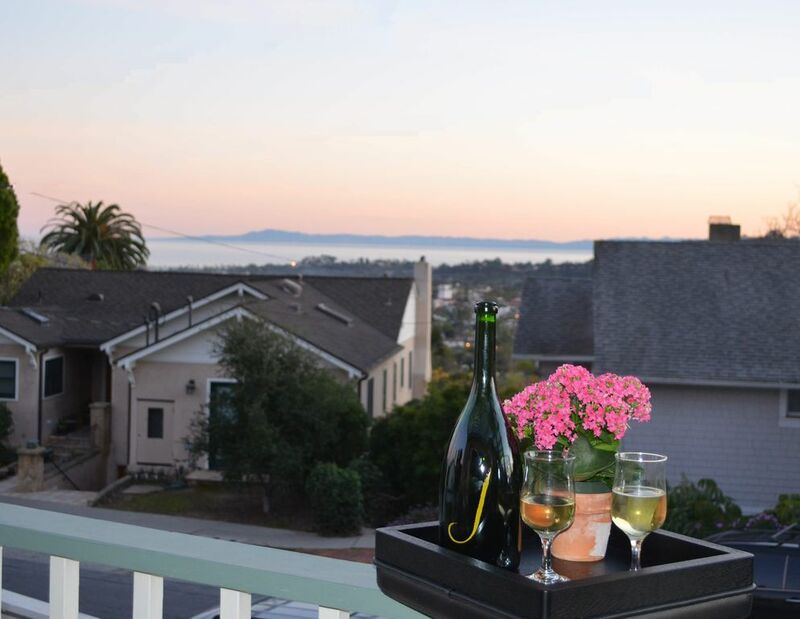 From the Living Room, Deck and Breakfast Nook enjoy spectacular views of both the ocean and downtown, providing for the total Santa Barbara experience. Please contact me on FLEXIBLE dates and rates. Our property is newly furnished with modern appliances and conveniences. We have a 30 night minimum stay. Our maximum nightly rate is $250 + tax. Dates and rates are subject to change. Contact owner for details @ 7146252864 call or text owner.